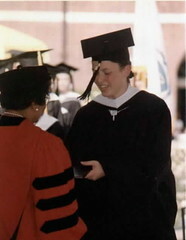 Ten years ago tomorrow (19th), I graduated from college. This weekend, I’m going back to reunite with fellow Smithies and see campus again. I’ve been back lots (last time in August) so it’s not as though I don’t remember the place. But it’s always nice to have a reason to visit. In honor of the occasion, I have posted a few photos from ten years ago. This entry was posted on Thursday, May 18th, 2006 at 7:43 am	and is filed under Friends & Family, Photos. You can follow any responses to this entry through the RSS 2.0 feed. Both comments and pings are currently closed. Hi Eszter, I’m gonna be in northampton this weekend too. maybe i’ll see you at herrell’s! irght now i’m in montreal, so you see others hav big travel plans too, though i agree that your travel schedule is more hectic. Let me guess, you’re @ AAPOR. :) Would be fun to see you in Noho. Looks like you made it back in one piece after your whirlwind weekend! Great to see you at our 10th – I’ll send you a link to my pics too when I’ve got them online. Chat soon! Sorry I missed you at reunion! I got there on Sat a.m. and heard that you’d already left for a wedding. I hope that we can catch up soon!